So, you’ve got friends in from out of town? They love Petaluma and want to take home a souvenir of P-town. Where to go for something fun? 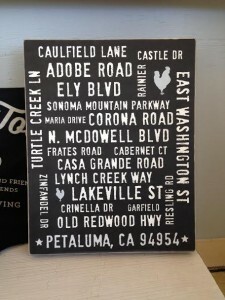 How about B Street Mercantile? The store, at the corner of Fourth and B streets, has been open just over a year. 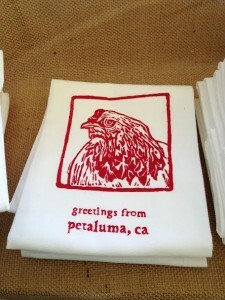 Jenny Paisley who, along with Patti Looper, owns the business, said, “Our goal is to create a place to find that unusual item.” And, as local craftspeople, they are reaching out to other local and Bay Area artists. Here’s a sample of what’s available. 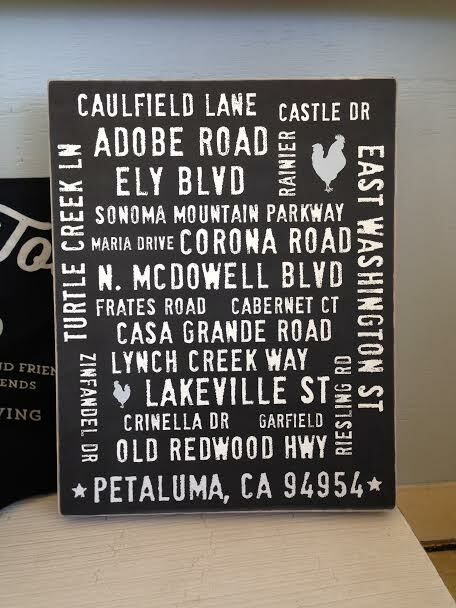 Street name montage: Finally, eastsiders get some respect: Caulfield, Casa Grande, Crinella, Frates, Lakeville, Maria – all front and center. And yes, westside types, you get your own plaque, too, and it even includes Pepper School Alley. $28-$48. Dish towels: Cow, chicken, whimsical or wine-themed patterns. $13.50-$22. 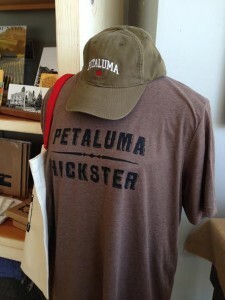 T-shirts: The latest is a manure-colored tee labeling the wearer a Petaluma Hickster. $26. Tote bags: With single-use plastic bags banned, these come in handy for locals and tourists. $14-$17.50. Body products: McEvoy Ranch offers a variety of lotions, balms and soaps made with their own olive oil, under the label 80 Acres. $7-$20. Postcards: Non-photo cards from Nicky Ovitt and Ricky Watts. $2. B Street Mercantile, 316 B St., bstreetmercantile.com. Open 10 a.m.-5 p.m. Tuesdays-Saturdays; noon-4 p.m. Sundays.